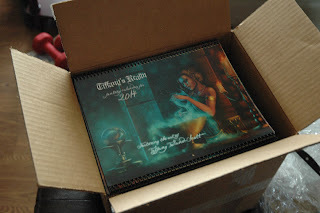 I am so excited, my calendars already arrived! They were on the porch yesterday morning, no idea when they actually showed up. I suspect they arrived on Tuesday and the FedEx guy just didn't bother to knock. There are 200 of them, so I have a couple of these big boxes in my living room. I've started signing them already, and I am planning on taking some with me to MisCon next weekend. They will go up online after DragonCon, assuming there are any left after all the summer shows. They are even more beautiful than last year's calendars. I think my printer just gets better and better every year. I can't wait to get mine in the mail!